Bryson Springs comes with no pre-generated characters, so the major element I had to add when running it as a convention game was the characters. I wanted the characters to be similar to the ones I created for Mazes and Monsters — each with their own baggage and pre-existing relationships which the players could layer on top of the plot of the adventure itself. I went to Wikipedia for inspiration, and many hours of reading later came up with what I think are a pretty great group of characters. WARNING – Lots of spoilers below. Please turn back if you think there’s a good chance you’ll be playing this one with me in the near future. I started with the seemingly mis-placed suggestion in the text of having one character be a criminal that is being transported by law enforcement. Law enforcement of one kind or another is a pretty obvious entry to this adventure, you can basically have an NPC command them to go investigate the mystery. I liked the added tension of having a criminal in tow, but I wanted to give that character a hidden ally in the group, so they wouldn’t spend the entire game being dragged around in hand-cuffs. Another thing I wanted was to be sure I had a couple female characters in the mix, and the idea struck me that maybe making the criminal a woman would be interesting. That’s when I started digging through Wikipedia for info on female gangsters and crooked cops that helped them. I was really looking for just a little inspiration, but what I found was the mother load. Soon enough I had five out of six characters set up as actual real historic personalities, fictionalized to fit the set-up of the adventure as needed. The sixth character is only related to a real personality because I needed him to be a little more anonymous in the group. Arizona Barker is of course the infamous “Ma” Barker. This is where I started, and I was really excited about the info I discovered on her. It looks like there’s a little bit of a debate as to whether she was really the criminal mastermind that J. Edgar Hoover made her out to be, or if she was just the mother of a gang of crooks who looked the other way. I decided to write her background in such a way as to leave that to the player to decide. You can play her as a devious criminal, or a sweet old lady, the choice is yours. 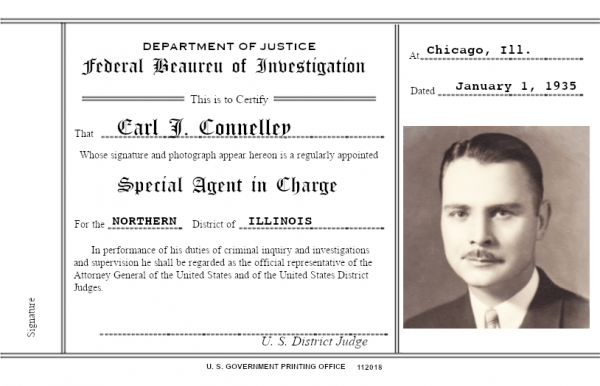 This lead me to include Earl J. Connelley, the actual g-man that took down Ma Barker. I decided to have the game start right after the shoot-out at which Ma is killed, only in my alternate reality she is only wounded and the FBI claims she’s dead so they can transport her unmolested. Connelley is basically the group’s straight-man, and his black and white view of the law is a lovely sharp contrast to Ma’s “do right by mine” attitude. The third member of this little triangle of mistrust is a beat cop from Florida, Joe Brown, who got assigned to help with the transport. 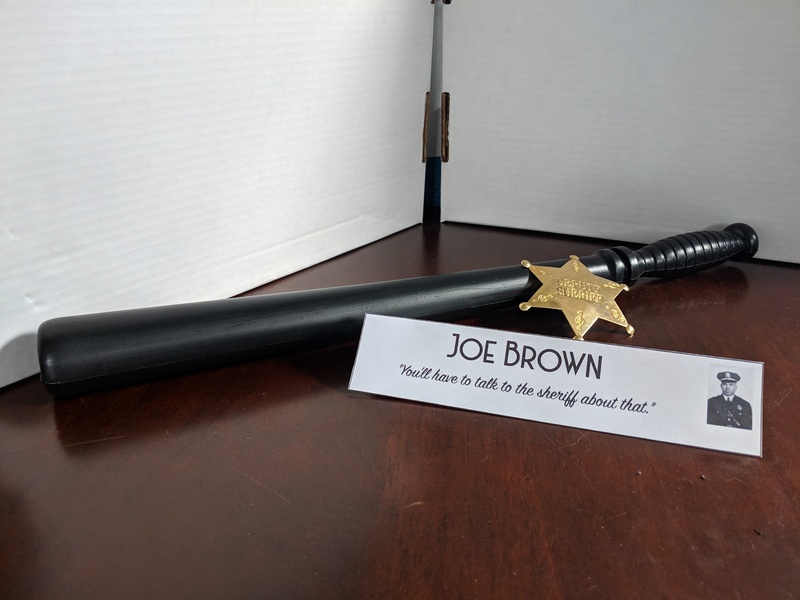 Only, it turns out he’s also the nephew of Tom Brown, a corrupt police chief from St. Paul who helped the Karpis-Barker gang evade capture five years earlier. This is my one mostly fictional character. He’s the brute of the group – big, dumb, and corrupt, with a bunch of gambling debts hanging over his head to add further fuel to the “help Ma escape” fire. That trio felt really strong, and provides all the physically adept characters to the game (they’re all pretty familiar with fire-arms). I next wanted to add some more cerebral characters, and I thought with the Dust Bowl / Depression angle of the adventure it would be fun to make some political adversaries. The site of the murder is a WPA project, so I wanted some characters who would strongly sympathize with the destitute Hooverville population, and at least one that would be a foil to that. 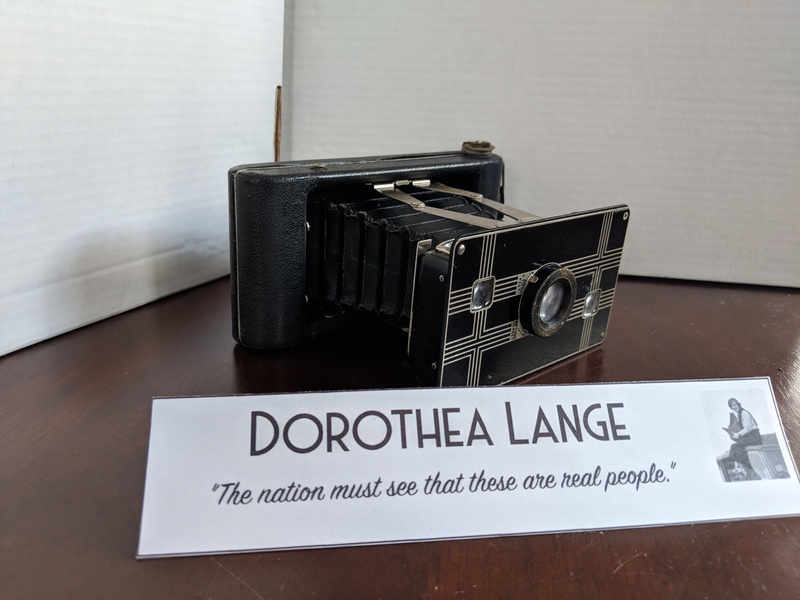 A Google image search of the Dust Bowl lead me to my second female character, Dorothea Lange, a photographer that took a lot of the most famous imagery from the Depression (such as Migrant Mother). Reading up on her Wikipedia article I discovered that right at the time this adventure is set she divorced her husband to marry her lover Paul Schuster Taylor, who likewise left his wife. It seemed like too interesting a personal drama to leave out, so Paul became character #5. The two of them start the game headed to check out the Hooverville, take some photos, talk to folks, and should seriously empathize with any of the poor victims they meet. So who could I add for their political foil? I started digging around for politicians that opposed the WPA. I was hoping also for a gross womanizer to be extra annoying to Dorothea and Paul. I discovered an outspoken WPA opponent in William Randolph Hearst, and given that he owned a bunch of newspapers and that the nosy newspaperman is a pretty strong Cthulhu trope, I started hunting for someone in his employ. If you can’t conquer a woman in an hour, she isn’t worth bothering about. So in came the yellow journalist as my last character, whose nature I hammered home with the physical prop of a hip flask with attached cigarette case full of candy cigarettes. That’s when I decided to use quotes in my character tents instead of descriptors. While “G-Man” would have been fine for Connelley, it’s already pretty obvious from the badge. I liked that the quote let me hint at his rigid world view a little. 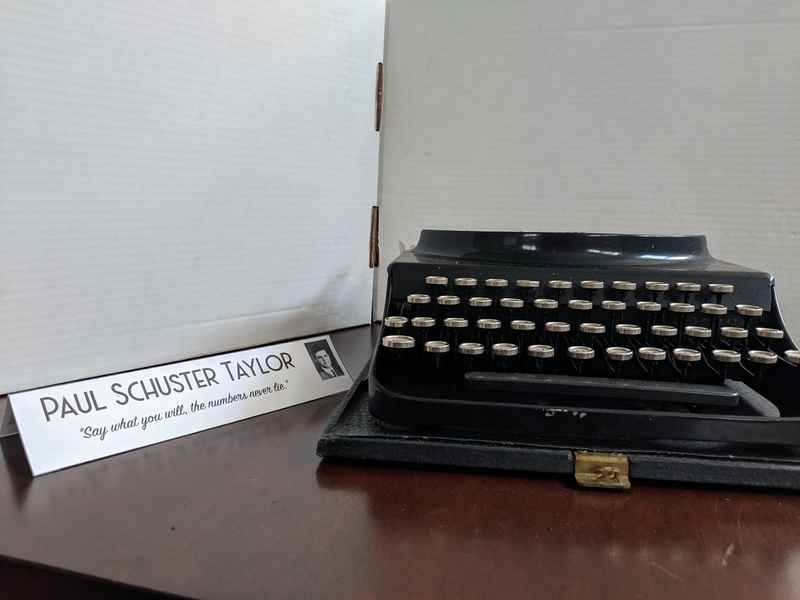 The typewriter for Paul and the camera for Dorothea were nice finds on eBay — both much more functional than I expected and they look great. Giving Arizona hand-cuffs and then indicating in her background that she’s supposed to be wearing them is pretty hilarious. 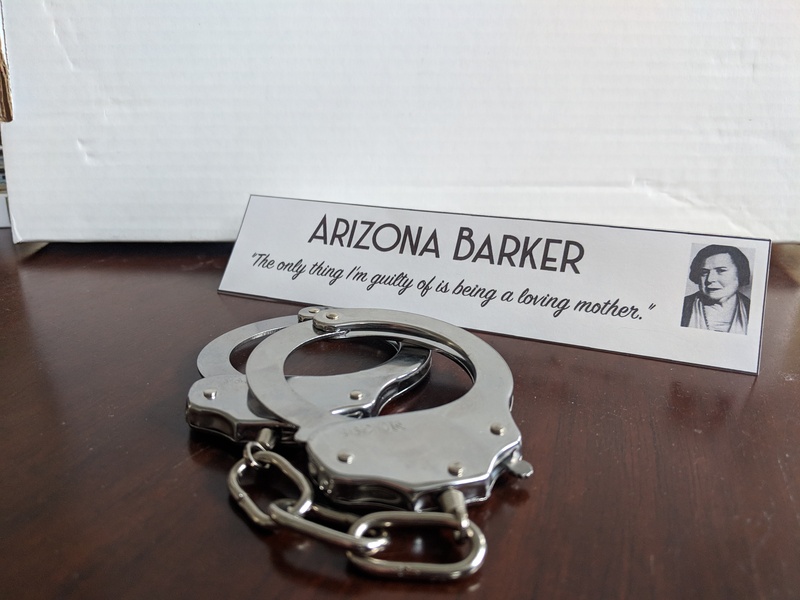 All my Arizona players were good sports about this, though I made sure to include on the character sheet that it was optional, and that the cuffs had a release button so they can be removed without the key. 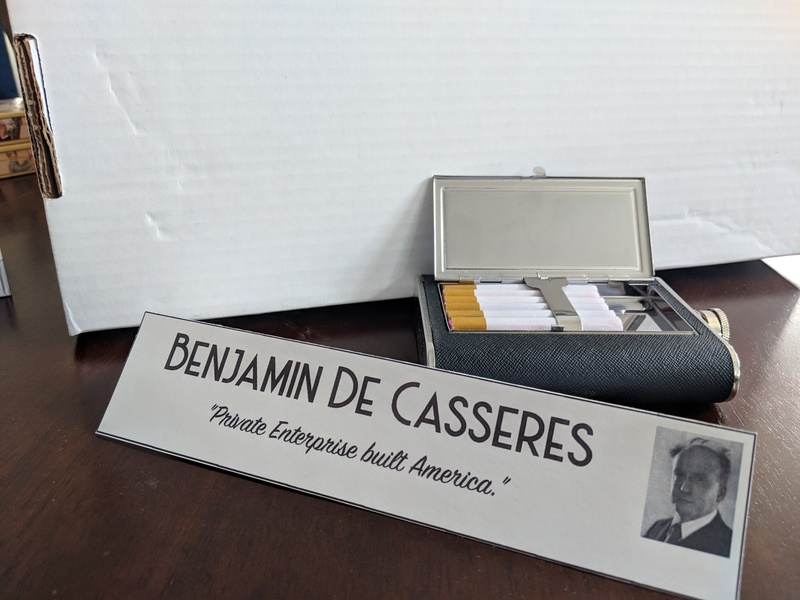 I printed it out onto some printable business cards (cream colored with a linen texture, to look old), then provided the two signatures by hand myself. 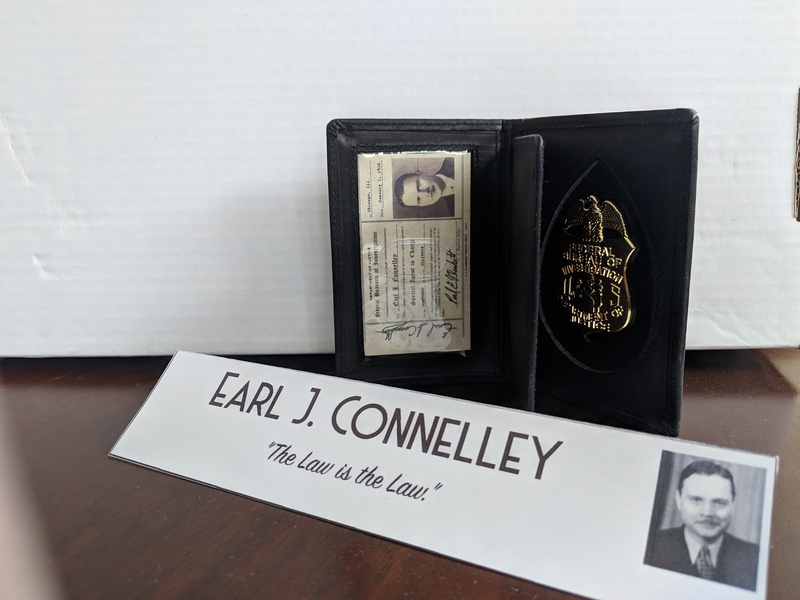 That was probably all way too much work for this one character, but I’m super pleased with out it came out, and I hope my Connelley players really enjoy flashing that badge to everyone at the table. That about wraps it up for my characters, but is only the start of my prop making for this game. So, look forward to another post soon of the rest of the props I made. I may have gone somewhat overboard.